Don't you just hate it when you buy a product and the price label won't come off and it leaves behind a sticky residue? You don't want you customers thinking that of your products so you need to make sure you use the right labels for price tags. 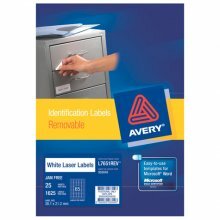 Avery Removable Labels are exactly what you need. You will be able to stick them securely to a wide variety of surfaces but when your customers remove them they are residue free.